Sanding is one of the tasks that most woodworkers will enjoy doing because it does not require much effort or a lot of skills. However even this simple and more enjoyable form of woodworking still requires you to have the right tool for the job. A good palm sander will make sanding quick and ensure that you always get some excellent finish. The palm sanders or 1/4 sheet sander might not look as sophisticated as other power tools, but they are essential when you need to smooth the surface for varnish, stain or paint. And so just like any other tool in your workshop you have to make sure that you get something top notch that can do the job fast and efficiently. You can also read other sander reviews such as Makita BO4556K, random orbit sander, belt sander, belt-disc sander, spindle sander, drum sander, detail sander, and sanding belt guide. DeWalt DWE6411K is a powerful and very efficient palm sander that will help you give your materials a smooth surface fast and with minimum hand fatigue. It is the lightest unit on our list as it only weighs 3 pounds making it very easy to handle for all woodworkers. This power tool operates with a 2.4-Amp motor that does the job at a speed of 14,000 OPM to ensure that you always get a superior finish without having to do a lot of work. Unlike most other sanders in the market, it also has a dust-sealed switch that is resistant to dust to ensure that it lasts for long. The DeWalt DWE6411K also features a sealed 100% bearing construction that gives it a long life. DeWalt gives this unit a textured body grip and anti- slip top that help to make it comfortable to operate while also giving woodworkers better control. Finally, this 1/4 sheet sander also has a high capacity dust bag with a built-in adapter for a vacuum and a low-vibration design to minimize hand fatigue. DeWalt DWE6411K is the lightest sheet sander on our list and also has a lot of power. These characteristics are what make it an exceptional choice for a woodworker that wants something powerful that is very easy to handle. With a total weight if 7.2 pounds, the Makita BO4556K is the heaviest unit on our list but also one of the best hand sander in the market. The impressive 14,000 OPM speed is what makes it one of the top units and its 2.0-Amp motor is what makes this possible. This palm sander features an all-bearing construction with precision engineering to reduce noise and vibrations and a large clamping lever that makes the paper change fast and easy. Also, it has a rubberized grip with a unique contour that improves operator control and comfort. Makita BO4556K has a through-the-pad system for collecting dust to ensure that you always keep the work environment clean. Lastly, the switch is in a convenient location to make one-handed operation possible, and it has a rubber seal to prevent dust contamination. 14,000 OPM provide fast sanding and a smooth finish. All-bearing construction reduces noise and vibrations. Rubberized grip with contour improves control and comfort. Easy and quick paper installation. Efficient dust collection for a safe and clean work environment. Convenient switch location for one-handed operation. Dust bag connection looks complicated and takes some time to comprehend. This power tool is for a woodworker that does not have a lot of time to spend on sanding but still want to get the best results. It works fast but also provides a smooth finish hence making it a very handy tool to have in your workshop. Makita makes some of best palm sanders in the market, and their BO3710 lives up to these standards. This unit is an efficient finishing sander that does the job with minimum noise and vibrations thanks to the built-in counterbalance system. But, it is the most expensive unit on our list, and so you should be ready to spend some extra cash to enjoy its services. The Makita BO3710 operates at 11,000 OPM, and so you can be sure that it will give you a smooth finish and do it fast and efficiently. It is also comfortable when working with as it has a rubberized grip that creates an excellent fit and maximum comfort. Lastly, this unit also comes with a 2-finger trigger switch with a convenient lock-on button to make continuous use possible and a through-the-pad system for collecting dust. Easy to use finish sander. Ergonomic handle and rubberized grip provide an excellent fit and maximum comfort. 11,000 OPM provide efficiency and a smooth finish. Inbuilt counterbalance system minimizes vibrations. 2-finger trigger switch with convenient lock-on button makes continuous use possible and increases operator comfort. Through-the-pad system for collecting dust. Sandpaper clips are not as robust as what you get from other expensive units. Makita BO3710 is one of the quietest 1/4 sheet sanders on our list, and so it is perfect for woodworkers who hate sanding noise. But is also the most expensive unit among our palm sander reviews and so it is also for those ready to spend some extra cash. The Black & Decker BDEQS300 is the cheapest palm sander on our list but is still a very high-quality unit. Black & Decker is one of the brands that feature prominently in expert palm sander reviews, and so you can expect to get the best service from this unit. This 1/4 sheet sander is perfect for both sanding and detail work and runs on a 2-Amp motor and at 1,600 OPM. This compact and ergonomic sander is ideal for use in tight spaces, and it has a paddle switch for easy on/off when using it. The switch is at the top section of the unit, and a natural press down is all you need for activation. Black & Decker BDEQS300 has a tri-layer filtration to increase its efficiency and a high-performance system for collecting dust so as to keep the work environment clean. Finally, it comes with 1 sandpaper sheet. 2.0 Amps motor provides enough power for sanding. Paddle switch provides easy on/off operation when working. Suitable for both sanding and doing some detail work. High-performance collection system for the dust to maintain a clean environment. Ergonomic and a very versatile palm sander. Compact design and shape make it perfect for tight spaces. It requires you to use both hands when loading sandpaper sheets. Woodworkers shopping for the best palm sander on a tight budget should buy this Black &amp;amp;amp;amp;amp;amp;amp; Decker unit as it is not only the cheapest on our list but also comes from a very reputable company. The Porter-Cable 380 is the second most affordable unit on our list, and despite being cheap, it still has all it takes to do perfect finish sanding. This 1/4 sheet sander has an ergonomic design that reduces operator fatigue, and it is compact enough to ensure smooth sanding in corners. Porter-Cable gives this unit a 2-Amp motor that operates at 13.500 OPM to ensure that you always get a superior finish fast. It also has a dual plane and a counter-balanced design to minimize vibrations so that you can operate it for long and comfortably. This sander comes with a dust-sealed switch to reduce the likelihood of dust ingestion, and it is in a very strategic place to ensure simple operation of the sander. Ergonomic for minimum operator fatigue. 2.0 Amps motor with 13,500 OPM for a superior finish. Dust-sealed switch to prevent dust ingestion. Compact design for easy sanding into corners. The dust collector does not trap all the dust. If you never want to worry about fitting the 1/4 sandpaper sheets into your sanding machine, this is what you should buy. Unlike most other palm sanders in the market, the papers are an exact fit, and it is also effective in keeping them in place tightly. 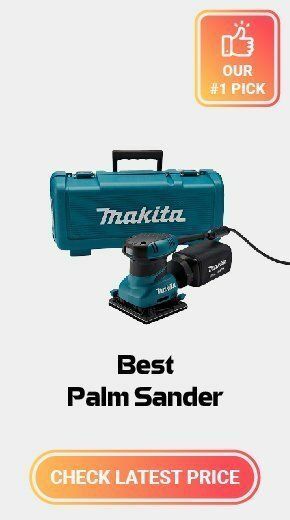 With our palm sander reviews above that feature some of the top units in the market it should be easy for any woodworker to find the best tool for different woodworking projects. But knowing how to choose the best among the many options in the market is still important. Although palm sanders from different brands may all look the same here are some of the things you should look for when shopping for one. If you have to stop your work and spend many minutes changing the sanding paper, you will not finish your projects in time. It is essential to always go for a sander that makes it easy to replace the sandpapers. The best finish sanders are those that have levers or a mechanism that makes tool-less paper change possible because they will save you a lot of time. With most power tools the bigger the motor, the better it will be, because this means that it will have more power to do the job. However, this is not the case with the sander because applying light pressure is what gives the best results. And so you should not go for something with too much power as it can ruin the surface. Instead of going for something powerful you should focus on getting a palm sander with a smooth operation and minimum vibration to prevent hand numbness and discomfort. It is important to ensure that you do not inhale dust when sanding and this is more so when working on painted and varnished surfaces because is poses a significant health risk. Although palm sanders might look small, they still produce a lot if dust. Luckily, modern ones come with a dust collector that minimizes the danger of inhaling the dust and also makes clean-up easy for you. The models with a built-in dust collection system use a fan to pull dust through holes in the sandpaper and blow it to a plastic collection bag. This dust collection system can be a disposable bag for some units while others make it possible to connect the sander to a vacuum hose. Finally, ergonomics is another important factor that you take into account when choosing the best hand sander for your projects. Most have a twin body style which means that you can hold them either on the waist or at the top. This design makes it possible to change your grip to minimize hand fatigue. Also, a sander with some rubber over-molds will have a more comfortable grip and less vibration. When buying a sander for your woodworking project the first decision you will need to make is whether to go with a palm sander or the random orbital sander. While both are very handy in the workshop, they are ideal for different situations. Palm sander or the sheet sander is for finishing work, and it is what you use just before you apply some varnish or paint the wood surface. These sanders are less powerful than the random orbit and their primary purpose it to give the surface a smooth and clean touch. The palm sander uses 1/4 of the standard 9 by 11 sandpaper, and this is why some woodworkers also refer to it as the 1/4 sheet sander. Most models of this sanding tool have an integrated spring-loaded clamp which is what keeps this sandpaper in place. The square shape of the paper on this sander makes it ideal for use when you want to get to the edge of a 90-degree angle. This sander moves in a back and forth design which is perfect when you do not want to go through several layers of material. If you do not have any thick layers of material on your wood surfaces to get rid of or you want something that will give you a smooth finish this is the sander for you. A palm sander is an ideal tool for finishing the surface for stain, paint or varnish. Also, it will be a perfect choice for woodworkers that want to give their wood surfaces a clean and aesthetic appealing look. Random orbital sanders are for preparing rough surfaces and have more power than the palm sanders. They are the best tool to use when you want to get rid of several layers of coarse material from a wood surface. Just like the palm or orbital sander, the random orbital sander comes with a rounded palm grip at the top. But it has a round pad, unlike the palm sander which has a square one. The pad on the random orbital sander moves in some "random orbits, " and this is where the tool gets its name. These movements make it hard for this sander to leave swirls on the material. Also, it spins in circles, and so you can use it for both smooth finishing and removal of stock, but its shape makes it difficult to reach the edges of 90-degree pieces. Some random orbit sanders have variable speeds, and this makes them easier to control than the sheet sanders. Their ability to do both prep work and finishing also make this one of the most versatile sanding tools.